Black soldiers received the first large-scale opportunity to dispel any doubts in May 1863 at Port Hudson, Louisiana. That spring, Port Hudson and Vicksburg were the two remaining bastions along the Mississippi River in Confederate hands. The War Department ordered Major General Ulysses. S. Grant to capture Vicksburg. Responsibility for the fall of Port Hudson fell to Major General Nathaniel P. Banks, head of the Department of the Gulf. For months the Confederates had been fortifying Port Hudson, particularly to the south and west, taking full advantage of the choppy terrain to erect an ominous defensive position. The occupation force consisted of some six thousand Confederates under the command of Major General Franklin Gardner. In late May, portions of Banks's Nineteenth Corps fought their way into a horseshoe-shaped position around the Port Hudson garrison, with flanks nestled near the Mississippi River, The 1st and 3rd Louisiana Native Guards, slightly more than one thousand black soldiers, occupied a position on the north side, closest to the river, The 3rd Louisiana Native Guards consisted of former slaves who had white officers, Originally, the regiment had black line officers, but Banks purged the unit of all black officers, regardless of qualifications or competence. The 1st Louisiana Native Guards, though, were free blacks, with black captains and lieutenants who for the time being were unwilling to buckle under Banks's pressure. 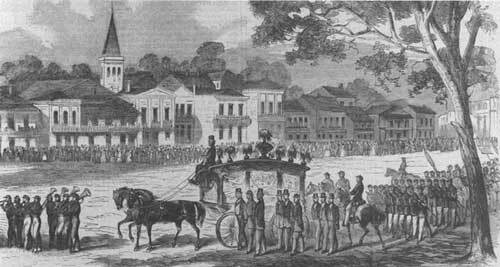 Among the officers of the 1st Louisiana Native Guards were Captain André Cailloux and Lieutenant John Crowder. Educated in Paris and fluent in both English and French, Cailloux was a man of great intellect and property, a pillar in the free black community of New Orleans. Not nearly as well known was Crowder, the young second lieutenant, Crowder came from a poor but free black family and learned to read and write through the efforts of his mother and a prominent black clergyman named John Mifflin Brown. Crowder fibbed about his age, and at sixteen he may have been the youngest officer in the Union army. "If Abraham Lincoln knew that a colored Lad of my age could command a company," he once wondered, "what would he say[?]" On the evening of May 26, 1863, Cailloux Crowder, and other men in the two black regiments occupied their position for the attack the following morning. The Federals were to pressure the defenders everywhere and, Banks hoped, break through at various locations where the Confederates were weakest, Yet for Cailloux Crowder, and their comrades in the 1st and 3rd Louisiana Native Guards, the attack had a special significance. The assault on Port Hudson offered them the first opportunity to demonstrate to all witnesses that the black race could match any white troops in prowess on the battlefield. The next morning, when they assembled in position to begin their advance, no one in the Federal army had explored the ground. Both terrain and earthworks suited the defense superbly. The black regiments were north of Foster's Creek and had to march over a pontoon bridge to get at the Confederates. From there, the Telegraph Road led to Port Hudson, A bluff ran parallel to the road on the Federals' left, and the Confederate riflemen occupied choice positions there. It was virtually impossible to dislodge these Confederates because the area between the road and the bluff was choppy and filled with underbrush and fallen trees. Even worse for the attackers, a Confederate engineer had tapped into the Mississippi River and drew backwater directly through that strip between the road and the bluff. Just west of the road was a huge backwater swamp of willow, cottonwood, and cypress trees. To the front of the advancing troops was a bluff, well protected by Confederate infantrymen and supported by artillery. The first assault came from troops to the east of the two black regiments. When those blue columns failed to shatter the defense, the burden shifted to the Native Guards. Around 10 A.M. they began crossing the pontoon bridge over Foster's Creek. Within seconds they came under Confederate sharpshooters' fire. Comrades fell to the ground lifeless. The uninjured quickly pushed over the span and deployed as skirmishers, working their way along the right side of the road. While the willow trees provided some cover, the backwater and felled timber slowed their advance. 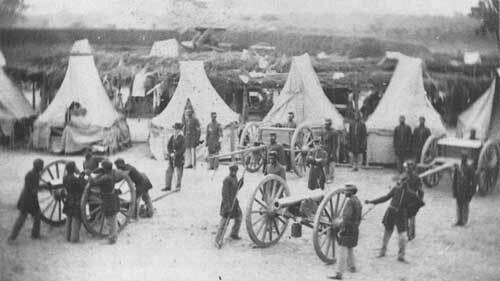 Then Confederate artillery began dropping shells among them, further depleting their ranks. Among the timber, six hundred yards from the main Confederate works, the black regiments halted, regrouped, and shifted to their left. They formed two battle lines consisting of two rows each, with the 1st Louisiana Native Guards in the advance. From the woods they emerged, advancing rapidly. As they cleared the timber, the Confederate riflemen on the bluff alongside the road peppered them in the flank, ripping gaps in the ranks. 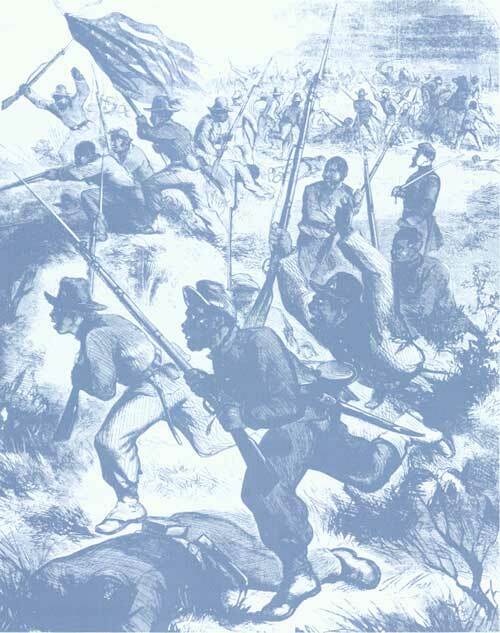 The black troops pressed onward. At two hundred yards from the main works, the Confederates let loose a shower of canister, shells, and rifle fire that tore through their lines. Raw courage alone sustained the survivors, who charged on toward their slaughter. When the sheets of Confederate lead staggered the first regiment, the 3rd Louisiana Native Guards forced their way to the front. Both the Union and Confederate commanders on the scene counted three charges. Not once did black soldiers break the Confederate line. Nevertheless, the black troops demonstrated dash and courage in the face of overwhelming odds. 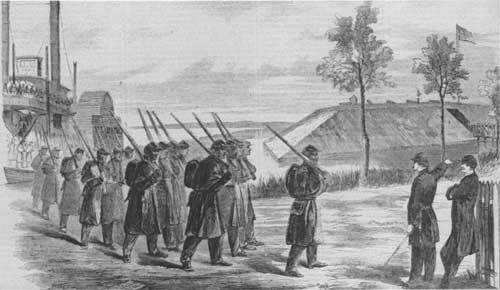 Some soldiers attempted to wade through the backwater to get at the Confederates, and a handful of others tried to scale the bluff where the riflemen had posted themselves. Everything failed. The Confederate defensive position was too strong. In defeat, these Louisiana Native Guards exhibited unusual grit. At the height of the battle, a captain observed a black soldier limping away from the hospital and toward the front. When he asked the soldier where he was going, the fellow replied, "I been shot bad in de leg, Captain, and dey want me to go to de hospital, but I guess I can gib 'em some more yet." Another soldier had a shell take off his leg below the knee. His captain, standing nearby, rushed over to comfort the soldier and promised they would return to care for him, "Never mind me take cair of yourself," the infantryman advised his captain. He then pulled himself on a log and "Sat With his leg a swing and bleeding and fierd thirty rounds of Amunition." The soldier died a few days later. Nearly two hundred black troops were casualties, some 20 percent of the two regiments. To highlight the utter futility of the assault, they had inflicted no casualties upon the Confederates. Among those who never returned was Lieutenant John H. Crowder. He suffered a critical wound, was borne to the rear, and died that day. His grieving mother gave him a pauper's funeral, all she could afford. Captain André Cailloux also fell. He had survived much of the battle, despite a rifle ball that shattered his arm below the elbow. Throughout the rest of the fight, it hung lifelessly at his side. Around 1 P.M., just before the final retreat, Cailloux was still at the head of his company. His voice hoarse from shouting over the gunfire and his body weak from blood loss, he led his men onward one last time. A shell struck him down permanently. After the battle, Union and Confederate troops declared a truce to retrieve the wounded and bury the dead. The pact did not apply to the sector where the black troops had fought. For six more weeks, until the Confederate garrison capitulated, Cailloux's body decomposed on the field. Not until late July did Cailloux finally receive a proper burial. Thousands of New Orleans black mourners, patriots all, turned out for his funeral. "The cause of the Union and freedom," declared a New Orleans newspaperman, "has lost a valuable friend." The Battle of Port Hudson marked a turning point in attitudes toward the use of black soldiers. A lieutenant in the 3rd Louisiana Native Guards "entertained some fears as to their pluck. But I have now none." Their dash convinced another officer: "They have shown that they can and will fight well." Banks, who wanted nothing to do with black officers, endorsed the concept of black enlisted men in his report to Commanding General Henry W. Halleck. "The severe test to which they were subjected," Banks wrote, "and the determined manner in which they encountered the enemy, leaves upon my mind no doubt of their ultimate success." The New York Times, which had cautiously endorsed the limited use of black troops on a trial basis just four months earlier, now declared the experiment a success: It was no longer possible to doubt the bravery and steadiness of the colored race, when rightly led.